Imagine giving a child a beautiful edition of a classic book, ornately decorated and written in an elegant font. Now imagine that child hasn’t been taught to read. Maybe they will appreciate the rough feel of the paper beneath their fingertips, and perhaps some of the illustrations will tell parts of a wonderful story. But for anyone who has ever truly lost themselves in a book, you know that the true magic, the true joy of the story is in the text. The child can’t access that magic if they can’t read. Money can sometimes be just like that book: a generous gift with good intentions, but one that won’t last more than a moment. Used, discarded, forgotten, on to something new. Giving the gift of a future is a powerful thing. From the money you put into the collection tin at your local supermarket to the monthly direct debit payment you make to the charity of your choice, you feel part of something, contributing to a worthy cause. In the current economically uncertain times we find ourselves living in, giving help to those who need it is even more crucial, and even more difficult. It is hard to know if the money you invest is going to reach those who you intend it for. It is hard to know who to help, because let’s face it: so many people need our help. At Vibha we understand this. It isn’t just about giving money to a good cause. It is about investing in projects that are long-lasting, that will benefit the people we want to help for years to come. It is about seeing the positive results of your help. In essence, it is about helping children have a future that without help, they cannot even dream of. For over 20 years, Vibha has been the movement that has matched generous donations with exceptional projects. More than $10 million has been invested in initiatives that do more than just give money where it is needed. These projects are set up to help overcome systemic problems and educate – to help people to help themselves. From new school shoes, to improving reading, writing and arithmetic in public schools, to helping eradicate child labour in the poorest of areas; it is easy to see what a difference is being made, and what possibilities for the future these investments will bring. These are the areas that we believe matter most, because these are the foundations on which we feel great futures can be built. Please help us build on these foundations. 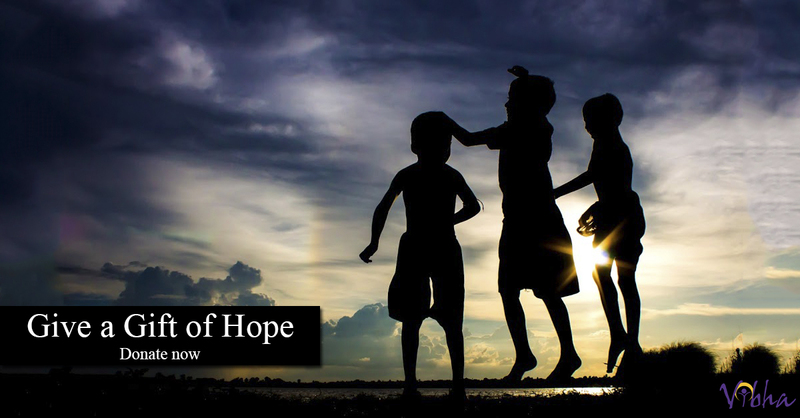 Please give the gift of hope.